Nancy remembers only two school-going children, both boys, in her time and that towards the end. The wardmaster took the able-bodied to fields between the Workhouse and the Paupers’ Graveyard to cultivate the plots of potatoes and vegetables. As one photograph included here shows, there were cultivated plots also between the Reception Area and the Hospital Road. There was also a piggery. The intention was as far as possible to be self-sufficient in food. But there was no internal manufacturing enterprise. Women worked at cleaning, cooking or in the laundry. Girls ‘in the family way’ were very temporary residents. Nancy remembers Mrs McCambley of Dominic Street who ran the laundry very efficiently. It served both the hospital and the Workhouse. Other tasks for the men included gardening and delivery of messages and mail to town. Around the turn of the century the Sisters of St John of God offered to work there and organized the senior staff of the Hospital – but not the Workhouse. They were efficient and settled some problems. It was Nancy‘s opinion that although the fare was plain, it was adequate and certainly no worse than that of the poor outside its walls. They ate as much as they needed and sometimes more than the regulation diet. However that still consisted mainly of porridge and potatoes, some bread and vegetables grown by the inmates. The sleeping quarters were not heated or lighted and had bare floors. Most inmates were long-term and friendless. They didn’t often leave the Workhouse except for very occasional outings. By then the regime was fair, and even caring. Nancy remembers no serious discipline problem in her time, or any repressive punishments. There were small separate Church of Ireland and Roman Catholic chapels where the respective ministers held Sunday worship services. They would arrive on request at other times. The bed and bedclothes and apparel of the paupers were plain but serviceable. Baths and toilet facilities were adequate. Men and women ate at separate tables, but no longer separate rooms. The dining hall was flagged and the paupers ate from tin plates. The man who administered outdoor relief in Newry Urban and Newry Rural was called Digney, and the relief was so called after him. He was seen as a strict and harsh man who didn’t like giving out money. The outdoor relief officers for South Armagh, John O’Dowd and James Donaghy for Crossmaglen were more kindly and less severe. Outdoor relief was means-tested and given in the form of food vouchers or money. At one time Mickey Griffin was Chairman of the Board of Guardians; his son Gerry was employed as wardmaster. He worked with the able-bodied men. Kathleen Cunningham, daughter of William T Cunningham [one time Councillor and important personage in Newry’s history – soon to feature in Characters herein – and mother of many of Newry’s personalities including Gerry (of musical fame) Morgan and Mary, wife of Chris Loughran of Champagne] remembered being brought as a visitor to the workhouse sometime in those last years. She was distressed to see young girls, rejected from their families because they had got pregnant out of wedlock, labouring all day over workhouse and hospital laundry while their innocent babies rested in orange boxes by their side. The last workhouse master who served from 1937-1948 was Francis Brooks. Nancy started work without finishing her school examinations because war had broken out and had changed many things. 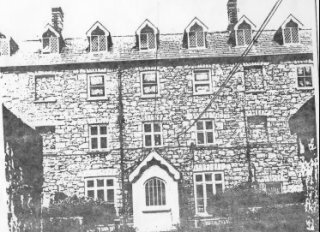 For one, the Newry Workhouse was given responsibility for the relief of Belfast in the event that bombing made evacuation a necessity. She was hired because extra help was required. The job gave her security and she liked it well enough. In the war years her husband worked on amphibious craft at Warrenpoint. By the 1940’s the role of the Workhouse in the community had altered drastically from its designated one of a century before. The Poor Law system was designed specifically to remove the poorest from the streets where they would beg, spread disease and bring distress to the regular population. By then, the provision of a night’s lodging to such people had become a major role. For resident paupers, strict discipline was still enforced – as it had to be – but husbands and wives and brothers and sisters were no longer permanently separated. Nancy Ferrier told me about working in the office in the 1940’s. The able-bodied women amongst the inmates helped with the cleaning of the office (Nancy knew the regime of the office rather than the ‘house’) but there weren’t many of that category. Most had some mental impairment. Nancy remembers feeling pity for the paupers – the name still applied to all inmates – but this was her job and it just became a way of life. The paupers were not then mainly from the Newry area. Most were of rural upbringing. A few were unmarried mothers who had their babies there and would be kept on for a year or two. Then they would have to leave and find their own way in life. The majority of paupers then were long-stay. They were friendless and pathetic and knew no other life. One day in 1948 the inmates were ordered to pack their few miserable belongings and board two buses which drew up outside. The Workhouse was closing. These poor creatures were totally distressed and disorientated. They were unhappy at leaving the only home they knew. There was nobody to say goodbye to them. They were told nothing. They didn’t know their destination. (Nancy later heard that some of them at least were brought to a home in Keady, but there wasn’t room enough there for all of them). She herself stood silently watching with the tears running down her face. One or two went to Dromalane House, like Frank Sloan. He had acted as messenger in the Workhouse. Another man named John McClennaghan, walked bent over from a physical deformity. He had served as a messenger occasionally too. He wept openly on the day he was sent away. There is no further record of the workhouse’s last inmates. Some images are not of Newry Workhouse but are similar enough to convey an impression to the reader of original workhouse conditions.